A Lifetime of Wealth and How not to Lose it. Also: securing, preserving Life Savings. 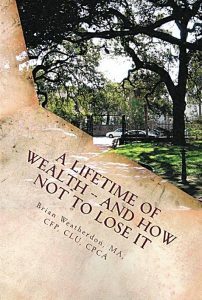 The first half of this book explores four unique events that may trigger ways that people may suddenly face the most important wealth-decisions of their lifetime. Stories add to the allure and insight of these chapters. We can also see how we’re never actually alone in these decisions. Partly because there are others (family, philanthropy) who will be greatly impacted by our decisions. Also, we can recognize the skills of a professional team to help the financial decisions we make. As a result you can feel more confident about trusting the right advisors and choosing a financial pathway that remains secure and rewarding for your future. No written plan to align your Money and Life. Many have been successfully saving money throughout their working years and yet still feel uncertain for their future as they haven’t been practicing the kind of lifestyle they’d want in retirement, and actually have no idea personally what they’d want to do for thirty years or so while not working. This led to a process of “Visioning Your Future” as described in another story here. Some questions here will also help you generate your own insights, whether for a mid-career sabbatical or a full launch into retirement living. Consider yourself the movie director for your future lifestyle, highlighting the “must haves” and the “bucket-list” items and all you will need to get comfortable and confident in the chapters of life yet to come. You will quickly expand your thoughts beyond the text here – this is only a launch pad to spur your own creativity until you can “experience the future now” and continue enlarging your dream, your vision, of life ahead.